Can anyone help Barbara with her enquiry to identify the couple illustrated below? The David Whyte photograph came from my Mackinnon grandparents, and from what I know of their families, it is almost certainly from the Mackinnon side of the family. 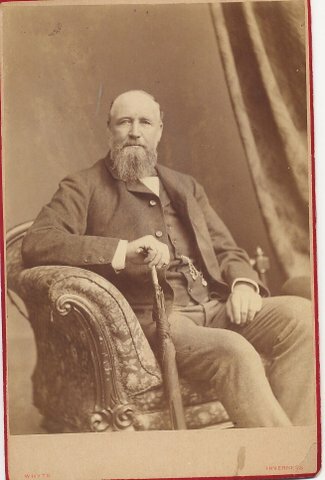 My great grandfather Godfrey B Mackinnon came to Australia to join several of his brothers who were already here in the mid 1850s. They all did very well financially, and all took trips back to Scotland from time to time. There were seven brothers in their family and I have photographs of four of them. This photograph could be one of the other brothers - there is a vague family likeness to my eye. The Highland photographic archive in Inverness holds the David Whyte studio archives and negatives, and they kindly searched their records for me, but did not find the negative in question. They did say that it was taken in the earlier years of the studio's existence, going on the printed logo and wording on the back. This would place it in the late 1880s or early 1890s. The wording "Mackinnon?" on the back was written by my aunt. 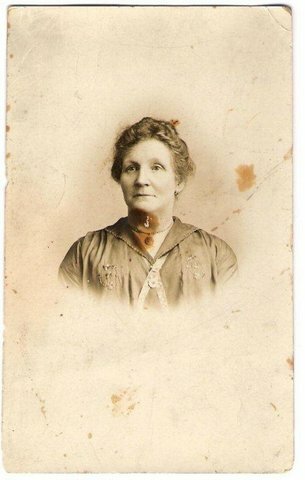 The photograph of "Jessie's mother" belongs to a relative of mine, and may possibly be connected to a family of M(a)cGruers. 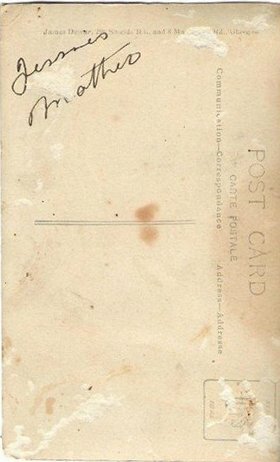 It is not known who wrote "Jessie's mother" on the back. 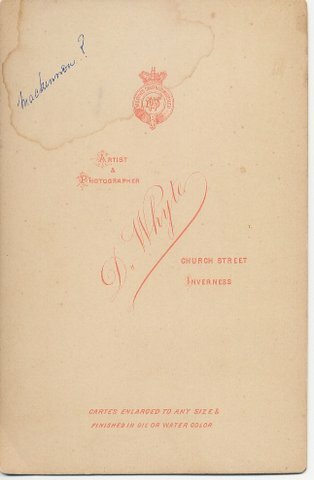 PS Jessie's Mother photograph - The photographer is James Dewar 296 Shields Rd & 8 Mathieson Rd Glasgow. I have been able to find out that this photographer operated at these addresses between 1914 and 1923. Thank you again for accommodating my photos.